A miscellaneous potted history of Monks Wood, the research station. 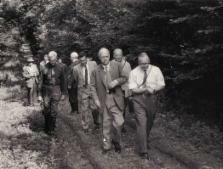 The woodland adjacent to the site was declared a National Nature Reserve in 1953, science staff were permanently based at Monks Wood from 1961 and the research station was officially opened in 1963. For the first decade the station and wood were both part of The Nature Conservancy. 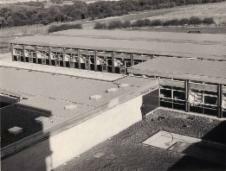 Subsequently, the station became part of the Institute of Terrestrial Ecology, then the Centre for Ecology and Hydrology. The woodland reserve became part of the Nature Conservancy Council, then English Nature and then Natural England. All science ended at the station in January 2009. I did the Met station readings at 0900 GMT each day and Prince Charles was due to arrive by helicopter from nearby RAF Wyton at 0900 hours just by the Met enclosure. There was great discussion on what I should do. Should I read them early, late or on time and chance being blown over by the down draught? It was all academic since fog closed in and HRH was driven up by car instead and so I missed the chance of being the first member of staff he saw. 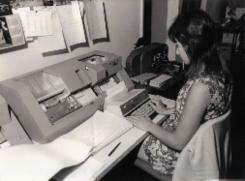 KM (Kenneth Mellanby, the director) was adamant that staff should treat it as a normal day and wear ordinary working clothes. He turned up in his usual tweed jacket and flannels with woolie cardie and, of course, a tie - but that was normal then. The Prince also wore his usual working clothes – a tailored grey suit. 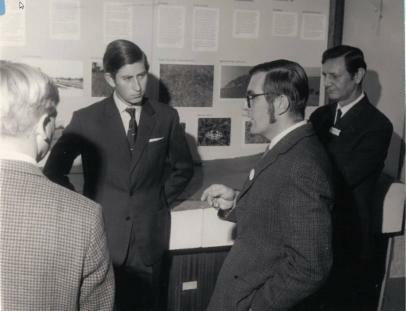 Various scientists were earmarked to give a presentation of their work in little groups and answer any royal questions; the intention was to give him a very good overview of the full range of work and staff. KM made sure that his young royal visitor got some light relief by selecting the most attractive young female staff, mini-skirted in those days, as his designated lunch companions. 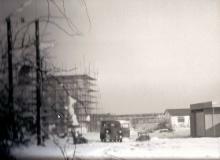 Somehow it was nowhere near as exciting as the visit from Prime Minister Harold Wilson with Anthony Crosland and Sir Solly Zuckerman in January that same year (see below) which was potentially much more important since they were our paymasters and needed to be impressed with what we were doing. They also attracted more attention and several hundred farmers turned up to lobby the PM while he was on their doorstep, breaking the gate to Monks Wood in their headlong rush up the drive to talk to him. They repaired it the next day with profuse apologies. It turned out his driver had not been told to stop at the gate for the PM to talk to them and the farmers thought he was breaking another promise. 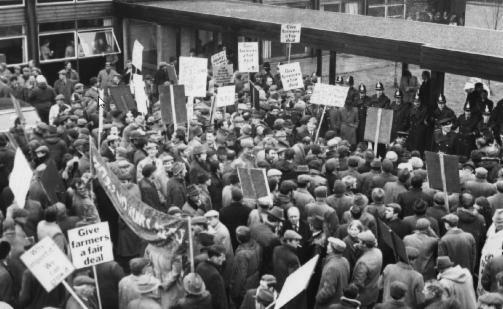 The Times Saturday January 10 1970 FARMERS MOB WILSON WITH COMPLAINTS Nearly 1,500 farmers demanding bigger financial support for agriculture broke down gates and surged through a police cordon near Huntingdon yesterday as the Prime Minister was visiting a nature conservancy. After accepting a petition, Mr Wilson told protesters through a loud hailer that decision on farm support should be taken after the price review in March. In Whitehall members of the Agricultural Wages Board dodged a farm worker’s pay demonstration. Within 10 minutes angry farmers had broken down the gates and surged through a 30-strong police cordon to the main doors of the conservancy. They began to chant: “We want Wilson” as police sealed off the doors and an inspector appealed for more peaceful action. 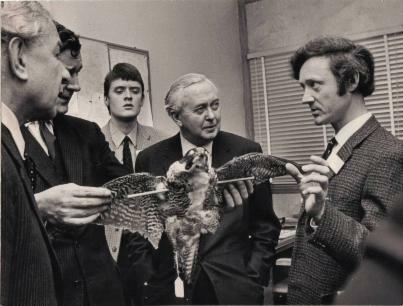 Solly Zuckerman, Tony Crosland, (a young and inquisitive) Arnie Cooke and Harold Wilson listen to Don Jeffries discussing the effects of pesticides on peregrines. 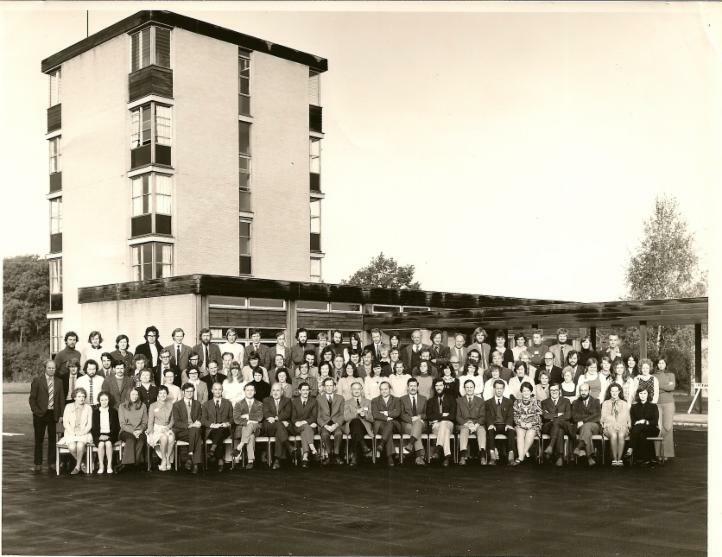 Henry Arnold has added a comment about the Harold Wilson visit. Regarding Harold Wilson's visit to Monks Wood, and the farmer's demonstration, the slightly different story I was told by Mr Ewart Chattell, who was the tenant of Safefield Farm was this. On the morning of the visit, coachloads of farmers arrived at Safefield Farm without notice to Mr Chattell. (Presumably they gave no notice for some sort of security reasons.) This had been organised by the NFU. They were expecting the Wilson cavacade to turn off at the farm and for Wilson to address the assembled farmers. When the cars swept past, they marched along the road from the farm to the station and broke down the gates to get to him. This sounds slightly more plausible than the farmers being gathered at the Monks Wood gates - there seem to have been so many they would have blocked the road and the gateway! I am afraid we can't ask Mr Chattell for more details, as he died some years ago, but I expect other farmers in the area remember. The following article was written in the 1980s and sparrowhawks can now be seen at Monks Wood on an almost daily basis. Professor Ian Newton FRS, the leading authority and author of many books on this species, was based at Monks Wood for several decades, its closure in 2009. The sparrowhawk is a secretive bird which breeds in woodland and hunts small birds. It is often confused with the commoner Kestrel, which is frequently seen hovering over the grass verges of motorways in search of mice. 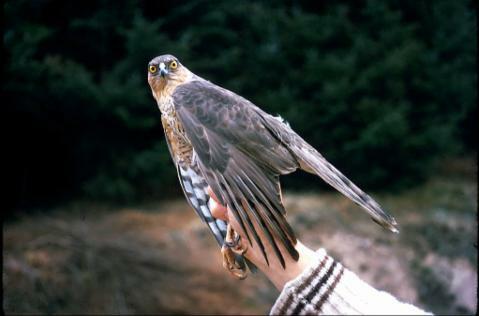 Sparrowhawks used to breed commonly in the woods of Cambridgeshire, but died out in the 1950’s when organochlorine pesticides came into wide use. Over the years these pesticides have been phased out, with less harmful ones replacing them, and sparrowhawks have now begun to come back. At Monks Wood NNR, a sparrowhawk nest was found in 1984 – the first for 25 years!The birds have bred there for three successive years since, and have also spread to occupy other woods in the area.Sparrowhawks are increasing throughout the rest of Britain, but because of the large amounts of pesticides used in Cambridgeshire, it was one of the last areas of Britain to be recolonised. The hawks still have small residues of the harmful organochlorine pesticides in their bodies, but not sufficient to prevent them breeding and surviving. The organochlorine group of pesticides contains DDT, Aldrin, Dieldrin and Heptachlor among others, and have been banned from much of Europe by EEC legislation, because of harmful effects on wildlife and concerns over human health. These findings are just some of the results of research by scientists at Monks Wood Experimental Station, who have been studying the sparrowhawk for over 20 years. 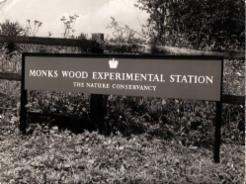 The experimental station at Monks Wood is one of six stations that make up the Institute of Terrestrial Ecology (ITE). ITE’s work is concerned with the natural interactions of plants and animals, and the effects of human activities on the environment.The results of this research are available to the government, and to organisations responsible for the protection, management and wise use of Britain's natural resources. Red kites were common in and around Monks Wood in the early part of the nineteenth century but were wiped out by persecution in 1844. However, they have become increasingly numerous in recent years following widespread introductions in the 1990s. Breeding was confirmed in Monks Wood in 2009. A nest was found by chance in one of the woodland blocks and two young were raised. The chance finding of a kite nest in 2009 made me think of other incidental observations made while recording deer and deer signs in Monks Wood. Like many other people, I tend to be fairly blinkered when in the field and something that is not a deer has to be loud, obvious or in the way in order to be noticed. I found the kite nest because of the abundant droppings on the ground where I was counting deer dung. Similarly I stumbled on a young dead buzzard when scoring deer signs in 2006 – as with the kites, this was probably the first breeding record for more than a century and a half. Counting dung also flushed a woodcock from its clutch of eggs in 1993, and I am fairly sure a purple emperor flew by me the same year. There have been a few unusual incidents with people. In the early 1990s I badly startled a shooter lying outside the northern edge of the wood and looking out over the farmland - and since then I have made sure people have seen me. In the north east corner, I came across a couple who had, to judge from their two cars, chosen to meet and pass some time in the Wood! Unfortunately their bored dog decided to adopt me and tagged along on my surveillance walk. Visitors often ask me how they can get back to their cars. One such lady was the niece of Mr Neaverson, who owned Monks Wood between 1943 and 1953. She remembered camping in the Wood during that period but had rarely been back since. One of the unluckiest animals I came across was a toad that I stood on in the middle of a woodland block. It survived the ordeal remarkably well, probably because I was wearing wellies rather than hard-soled boots. I was also wearing wellies when I stood on a wasp’s nest during one of the many wet days this summer. They quickly went from being dormant to angry, but probably thanks to the wellies I got away with a single sting. 2009 has been a good year for incidental sightings with two red deer stags in April (hard to miss) and a musk beetle on browsed coppice regrowth in August. I am still looking out for my first big cat. Apart from several moggies, the best I have managed was a buck Chinese water deer on the road verge by Bevill’s Wood one morning in 1976. Because of its tusks and the height of the vegetation, a passing motorist subsequently reported it to the police as a lion. They sent out a marksman but it was hit and killed by a car later that day.